The Philadelphia Flyers have absolutely dominated the Atlanta Thrashers in the past few season. The horrendous 2006-07 Flyers squad managed to sweep the season series (4 games) that year. The last time Atlanta defeated Philadelphia? In a 6-5 overtime game three years ago. Antero Niittymaki, the likely choice for John Stevens tonight, is a whopping 9-0-0 against the Thrashers. He’s also never lost to his countryman and fellow netminder Kari Lehtonen. But all of that will mean nothing if the Flyers slack off this evening. Two wins over an interdivisional rival with a Hall of Fame quality goaltender can move mountains for a team starving for confiden ce. So it’s important that the Flyers carry the weekend’s momentum – and intensity – into tonight’s game in Atlanta. One other thought before puck drop. Scottie Upshall, that ball of pure spitfire the Flyers picked up from Nashville in exchange for Peter Forsberg, has been a rockstar of late. After John Stevens benched him late in the 2007-08 regular season, Upshall has shown a determination and discipline on the ice that is simply unbelievable. He’s the match that sparks Jeff Carter into action, and he is a joy to watch. As a fan, I would love to see him continue his streak of great play into tonight’s game. Joffrey Lupul’s goal demonstrates the importance of hard workin the NHL. He and linemates Scott Hartnell and Mike Richards ground it out along the boards, pursuing the puck across and through the Thrashers zone. That tenacity led to Tobias Enstrom’s turnover in the center of the ice. And that turnover, combined with the lack of defensemen anywhere in front of Kari Lehtonen, led to a golden chance for Lupul. He buried it. Luca Sbisa looked fabulous in his first game as an assured member of the team. The calm he displayed while quietly poke checking a speeding Jason Williams, then following that with a well-placed deflection was incredible. Sbisa was the only Flyers defenseman behind the blue line at the time, let alone between the Thrashers offense and Niittymaki! I also appreciated his attempt at an open ice check of Ilya Kovalchuk about halfway through the period. Kovalchuk successfully dodged Sbisa. But that’s not the point. This 18-year-old fearlessly targeted a major NHL veteran, a guy who has scored more goals in the past five years than anyone else (as Versus loves to tell us each time the Thrashers are featured). Overall, the Philadelphia Flyers produced a solid effort through 20 minutes of play. I’m a little uncomfortable with one thing – they allowed the Thrashers two extended periods of puck control in the offensive zone. A better team would have scored on at least one of those. That must improve moving forward. What a classic Mike Knuble goal. Not only does the original shot by Glen Metropolit deflect off the sprawling Thrasher defender, the puck then bounces off Knuble’s leg or skate rather than his stick. But it just goes to show that good things happen when you go to the net. The score doesn’t entirely reflect the play here, though. Atlanta picked up several quality chances, particularly during the last 7 minutes or so of the second period. They had the Philadelphia Flyers on their heels, and Braydon Coburn eventually picked up the penalty. Sustained pressure resulted in a deep scrum; without Niittymaki, this could be a one goal game. 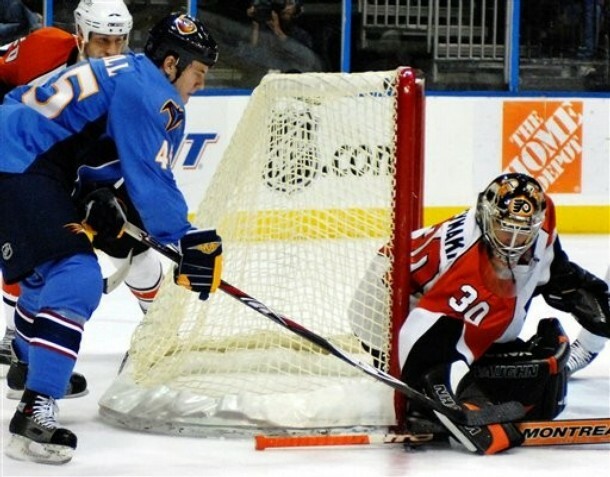 And then there’s that short-handed goal from Simon Gagne. Next to Richards, there is no one on this Flyers team that can read and react to a play quite like Gagne. Combining him with Richards on the penalty kill is a potent combination, both offensively and defensively. Hopefully we’ll see many more where that came from. You also have to love what Jeff Carter is trying. He and Lupul are shooting from absolutely everywhere. Carter even ripped one on Lehtonen from the faceoff circle. Anyone want to start placing bets on how many Carter will score this year? A good continuation of momentum on the part of the Philadelphia Flyers. They continue to show offensive prowess, and they finished a game strong. That said, the Flyers relied rather heavily on big saves from Antero Niittymaki. They need to bring a higher level of intensity in the future if they want to perpetuate this success. It’s turned into a rout and that losing streak you mentioned will continue for the Thrashers. Think anyone will get a Hat Trick? As for how many Carter will score… Well his current pace would put him at around 62, but I’ll cut that down to 54 as my guess. I wouldn’t be too surprised if he /does/ hit 60 though. I’d love to play Atlanta 8 or 9 times here – we’d catch up to the Rangers really quick then. Carter reminds me so much of Mats Sundin when he plays like he has recently. He’s all over the ice. I just wish he weren’t so streaky. And better on faceoffs. Hey, with the way they get thrown out in Philly, I’m beginning to think wingers are our primary faceoff guys. You could be like Chargers fans and blame it all on the refs. Yes, I’m a Broncos fan and I just brought up the NFL again. But they’ve been whining over ONE BLOWN CALL! I’m done with my rant now. Those Chargers fans think they have it bad? Try being Bud Selig, stuck in the city of Philadelphia, with three and a half innings to go. If I were him, I wouldn’t eat the food or drink the water. You mean he bothered to make an appearance? What do you think he would have done if the game got rained out with the Phillies still up a run? Oh, Bud Selig is still in town. Of that you can be sure. They haven’t finished Game 5 yet, and he really can’t escape to safety until they do. All I’m saying is – Selig is in a hotel somewhere. And you can be sure that hotel has housekeeping. If two idiots in Philly can find a way to smuggle smoke bombs into the Wachovia Center, what do you imagine could happen to Selig at that hotel?